This Nintendo Labo Variety Kit can be used to build an additional or replacement Toy-Con, or design a new Toy-Con. This pack includes all the parts required to build the Variety Kit Toy-Cons, but does NOT include the Variety Kit software. The Variety Kit includes six different Toy-Con to Make, Play, and Discover: two Toy-Con RC Cars, a Toy-Con Fishing Rod, a Toy-Con House, a Toy-Con Motorbike, and a Toy-Con Piano. *Nintendo Labo game and Nintendo Switch™ system required (not included). 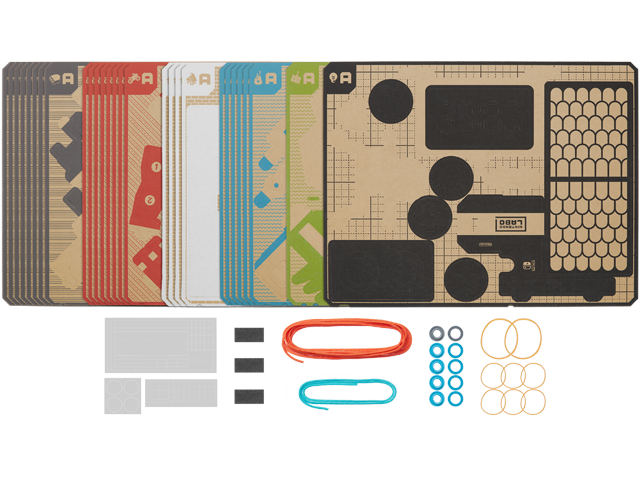 Game is only available as part of the complete Nintendo Labo Variety Kit set which is sold separately. Rubber bands included in this product are made of natural rubber (latex). Cardboard made in USA. Other components made in Japan.